Ancient Times - 1st millennium B.C. The Villanovans- Consist of various groups of early people living though out the Italian peninsula. These people built small communities in the hills surrounding the fertile plains of Italy. They were primarily shepherds and farmers. Many of the Villanovan settlements were ultimately occupied by a tribe of people that established the first true civilization in Italy- the Etruscans. Etruscans - The Greeks called these people Tyrrhenia or Tyrsenia; the Romans called them Etrusci or Tusci. They called themselves Rasenna. The Etruscans were at their greatest power between 700 and 500 B.C. The area of the Italian peninsula that they dominated was known as Etruria and includes an area from modern Tuscany to Rome. The Etruscans also controlled a small area in the Campania region which includes modern Salerno and Pompeii -- close neighbors of Corleto Monforte. The Etruscans appear to have settled on sites that were Villanovan villages. Where did the Etruscans come from? The ancient Greek historian Herodotus suggested in his book The Histories that the Etruscans immigrated from the small country of Lydia in Asia Minor. Although another Greek historian, Dionysius of Halicarnassus, believed that the Etruscans were indigenous people, the Roman historian Livy and the Greek historian Polybius agreed with Herodotus. Indeed, archeological digs support the view that the original Etruscans were an Oriental or Middle Eastern people (emigrating from somewhere between Syria and the Hellespont) and first settled in the the marshy, coastal land of the Tuscany region around 900 B.C. Etruscan power began to decline in the 5th century B.C. as they were challenged by other groups. The Romans conquered Etruria about 283 B.C. Gradually the Etruscans assimilated into the Roman culture. Ligurians - The Ligurians are an ancient Italic people believed to be indigenous to the northwestern Mediterranean coast, from the mouth of the Ebro River in Spain to the mouth of the Arno River in Italy. (Today Liguria is a region in the northwest area of Italy.) These people emerged from Neolithic times and they lived in scattered, remote village settlements. Ancient authors described them as rough, strong and bold people. The Romans's experienced the fierceness of the Ligurians as they were expanding their empire and grew to deplore the Ligurians (they conquered the Ligurians during the second century B.C.) Despite their boldness, the growth of Etruscan power in the Po valley and invasions by the Gauls and other peoples confined the Ligurians primarily to the Alps and the Apennines. Lucca, for example, a city that today is in modern Tuscany, was founded by Ligurians. Lucca was at the border of the Ligurian and Etruscan populations, but was inhabited primarily by Ligurians. In 180 B.C., at time when Rome controlled the entire Italian Peninsula, many Ligurians were transported to the Samnium region of ancient Italy-- a region which today includes Campania. Latini (Latins)- This Italic agricultural and pastoral tribe lived in the area of the Alban Hills, just to the south of the mouth of the Tiber river. (This general area became known as Latium.) The Latini were shepherds and farmers (descendants of Villanovans? ), living among the other Italian tribes, such as the Sabines, Samnites, Umbrians, Aequians, and Volscians. The Latini and the Sabine are believed to have founded Rome. Samnites -This Italic group of people are believed to be descendants of the Sabines (the Greeks called them Saunites). The name identifies a tribe populating the ancient area of Samnium (in the Apennine area of the modern regions of Molise and Campania). These people were, like their ancestors, mountain people who spoke Oscan. They moved from central-southern Apennines towards the fertile lands of Campania. The Samnites were described by Pliny as having a more vigorous temperament than any other italic tribe on the peninsula. The Samnites were divided into four tribal states (Caraceni, Caudini, Hirpini, Pentri), each administered by a meddix (a tribal chief) These tribal states were linked together in a confederation led by a generalissimo in wartime. As they grew in number and strength they rapidly conquered the flourishing towns of Capua (438 BC) and Cuma (421 BC). They also conquered Paestum which had already been occupied by a group that descended from their own tribe- the Lucanians. The Romans engaged in 3 major Wars with the Samnites. The first war (343-341) gave the Romans control of northern Campania; in the second war (327-321, 316-304) the Romans took control of Apulia, Lucania, and southern Campania. During the third war (298-290) the Romans took control of most of the Italian peninsula. Lucanians - The Samnites, like their ancestors the Sabini, often declared "Primavera Sacra". According to ancient historian and scientist Pliny the Elder (Plinio il Vecchio), who died in the Vesuvius eruption on Aug. 24 79 A.D., one of the Samnite migrations was led by a man named Lucius around 600 - 550 B.C. These people became known as the Lucani and they grew to be a strong Italic power. The Lucanians first occupied the city Eburun (Eboli). As they traversed the mountains following the Sele river they occupied the ancient cities of Vulceium (today it is Buccino) and Ursento. Next they took Numistro, founded Abella, and conquered Bantia. As they moved along the Tanagro river they founded Atella and Teggiano. As they migrated further they founded the ancient city of Sontia (today's Sanza) and conquered the Grumento along the Agri river. The entire area of southern Italy that they occupied became known as Lucania. Today much of the ancient land of Lucania is the province of Basilicata and the southern part of Campania. As the Lucani were expanding south through Campania they passed through the modern provinces of Avellino and Salerno- Vigorito territory. It is believed that the Lucani first conquered the Greek settlements (inhabited by a tribe called Enotrio) of Montepruno (Roscigno) and Phasis (Sant'Angelo a Fasanella) around 500-470 B.C. In order to dominate these two ancient Greek settlements, especially the town of Phasis nestled in the Valley of Fasanella, the Lucani built Coryletum (Corleto Monforte) which overlooks the valley. By 400 B.C. the Lucani also conquered the Greek city of Poseidonia (Paestum) whose ruins are still present and are a significant tourist attraction. It is a possibility, therefore, that the Vigoritos are of Lucan descent..
Brutti - The Lucani appeared near Laus about 390 B.C. defeating the Thurii and introducing their Oscan language to the area. In 356 the Oscanized inhabitants of this area asserted their independence from the Lucani and became known as Bruttii, probably an ancient name which the Lucani adopted as their word for "run-aways". Greeks -The Greeks arrived in southern Italy about 800 BC. They came from Euboea, Argolis, Locris, Crete and the Aegean islands, settling along on the southern coasts of the peninsula (from Campania to Apulia) and eastern and southern Sicily. The term `Magna Graecia' (greater Greece) describes a civilization made up of many Greek tribes that lived in lower Italy. Interestingly, Corleto Monforte is located in the Campania region that was the border between Magna Graecia and the italic peoples (e.g., Etruscan, Lucani, & Latini). Indeed, it is believed that the Lucani built Coryletum (Corleto Monforte) on a ridge of the Alburni mountains to dominate the conquered Greek towns of Montepruno (Roscigno) and Phasis (Sant'Angelo a Fasanella) in the valley below. The Achaeans (of Dorian origins) were among the first Greeks to settle on the Italian coasts. They founded towns like Taranto, Metaponto, Poseidonia (Paestum), and Sibari. The Locrians and then the Chalcidians from Euboea followed the Achaeans, founding Naxos (Taormina), Zancle (Messina) and, after the occupation of Pitecusa (Ischia), Cuma in Campania. 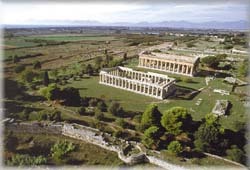 The Corinthians founded Siracusa and the Megarians founded Megara Hyblaea on the Gulf of Augusta. Romans -The small town on the Palatine hill in Latium (modern Lazio) founded by the Latini and Sabini and named after Romulus grew into the mighty Roman Empire. The Roman expansion reached the Campania area approximately 340 B.C. In 325 B.C. the Romans asked the Lucani for help in defeating the Samnites. For many years the Lucani alternated their alliance with the Romans often fighting with them and more often fighting against them. The Lucani's final battle against the Romans occurred in 90 B.C. Unlike previous wars, which were attempts to conquer the Romans, this final war was a social war initiated by the Lucani to gain citizenship in the Roman empire. The Lucani lost the war but nevertheless became Roman citizens along with all the other tribes in the Campania region. Of course, at this time Corleto also became a Roman town.